The sporty Mazda 3 Skyactiv is now 3 years old and for 2017 it has undergone a thorough revamp and facelift. At first sight you’re aware the front is slightly different, but to appreciate what has been done you have to look at the 2016 and 2017 versions side by side. The new LED headlights sweep into the grille in the same attractive manner as those on an F30 BMW 3-Series. The Mazda badge is now inside the grille rather than creating a bump in the panel above. And the indicators and foglights are now combined into neater, twinkly little assemblies either side. The overall effect is a freshening of a look that wasn’t half bad in the first place. 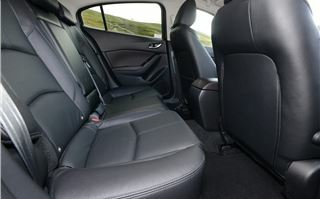 Inside, the car has been “sixed up’ with the features of the current model Mazda 6. 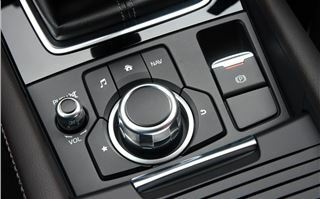 An electromechanical parking brake switch frees space for a large tandem cupholder just below elbow level. 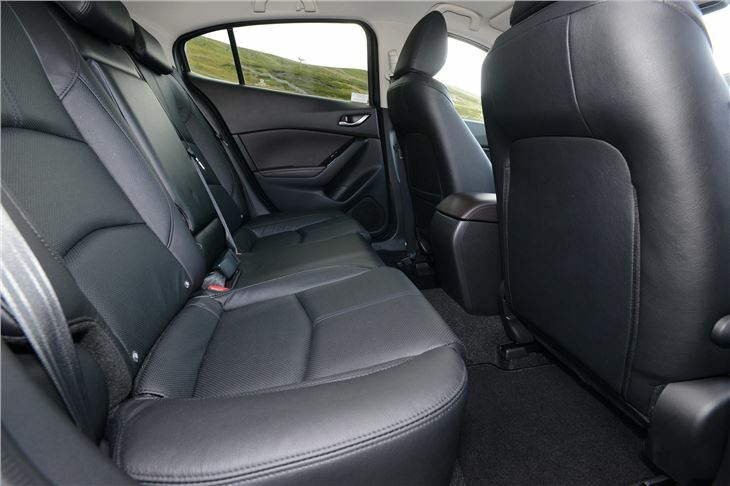 Switchgear and trim have been pleasingly improved and the black leather of the 165 Sport Nav brings with it genuine double stitching as in the Mazda 6. Happily, all models retain the nice leather steering wheel of the original that is exactly the right thickness, size and feel and remains as informative about what the front wheels are doing as before. 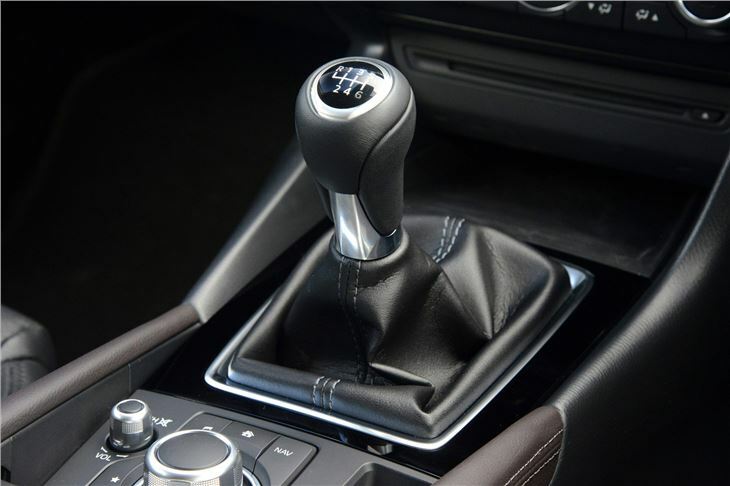 And the same slick and precise 6-speed manual gearshift. 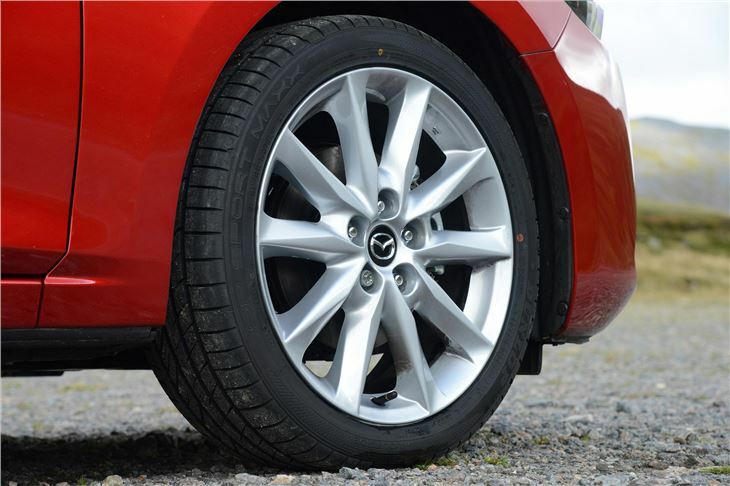 Handling is marginally improved in all models by the adoption of G-Vectoring Control, first encountered in the Mazda 6 this summer. Instead of braking a wheel to induce ‘torque vectoring’ the system almost imperceptibly cuts the power to one of the front wheels and the effect is to make both cornering and driving in a straight line comfortable for both driver and passengers. It works better with the 215/45 R18 tyres than the 205/60 R16s. 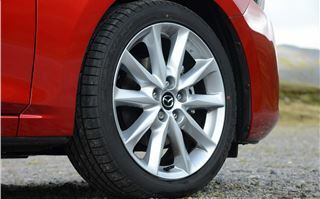 We drove a 120PS 2.0 Skyactiv G petrol, a 105PS 1.5 Skyactiv D diesel and a 165PS 2.0 Skyactiv G petrol. The 120PS SE-L Nav seemed to rev more freely than the 120 I drove back in 2013, yet was quite high geared at 30mph per 1,000rpm in 6th so required a bit of gear changing to make progress. However it could fall over a bit on its 60 profile tyres if a corner was taken clumsily. Ride quality throughout was excellent. Next, the rather remarkable 105PS 1.5 litre Skyactiv D Sport Nav. 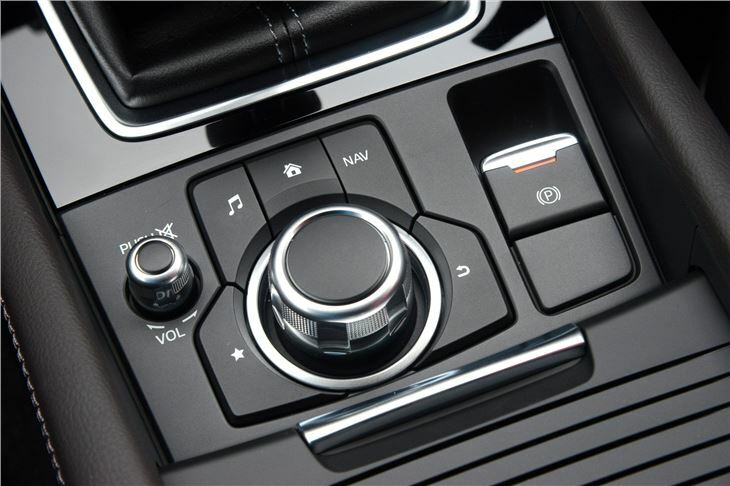 This features ‘Transient Control’ that, together with its relatively low compression ratio for a diesel, makes is feel more like a petrol engine than a turbo diesel. Peak torque of a mere 270Nm is sustained from 1,600 to a high 2,500rpm, so this is again an engine you can rev to get the most of it. Despite that, and seeing some fairly high average speeds across country, it still turned in and astonishing 46.3mpg. So, geared at about 33mph per 1,000rpm it should be capable of seeing 65mpg or more cruising at 70 on the motorway. (We’ll see when the Real mpg figures come rolling in.) It also comes in at 99g/km CO2, which still makes it annual VED free. And it gets better. We were “knocking on”, as enthusiasts used to put it, yet on its 215/45 R18 tyres the suspension remained compliant and the G Vectoring did an outstanding job of making the experience for both driver and passenger completely stress-free. It simply flew over yumps and bumps, absorbing them softly yet positively and leaving the front wheels on the ground to steer the car round the next bend. Better than an A3 or a Golf of a Leon. Better even than a Focus. Last for a blast was a 2.0 Skyactiv G 165. This is lower geared than the 120 at 25mph per 1,000rpm in 6th and with 210Nm torque is significantly livelier. No turbo, of course, but very sweetly balanced and with enough performance to keep a driver living in the country happy even though it’s more to tax and uses more juice than the 120. 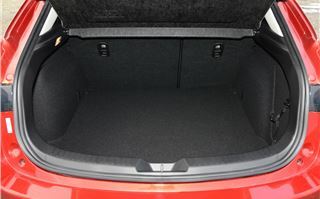 All the 2017 Mazda 3s cost £200 more than they did before and the extra kit not already mentioned includes folding door mirrors, and, depending on trim level, speed limit recognition, Smart City Braking from up to 24mph to protect pedestrians, standard hill holder assist when the parking brake is released, while Sport Nav versions come with rear cross traffic alert that automatically stops the car while reversing if something is about to cross its path. If there’s one bugbear, it’s the seats. The fronts of the squabs are too low, there’s no rake adjustment for the squabs. I had the same problem with my otherwise excellent long-term Mazda 6 in 2013, and have it with my current Honda HR-V. 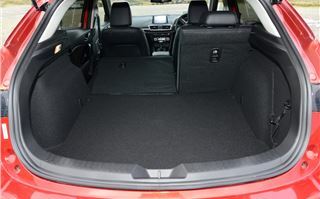 Yet the seats in my dinky little FIAT 500 give perfect support. If FIAT can do it, then why not Mazda (and Honda)? 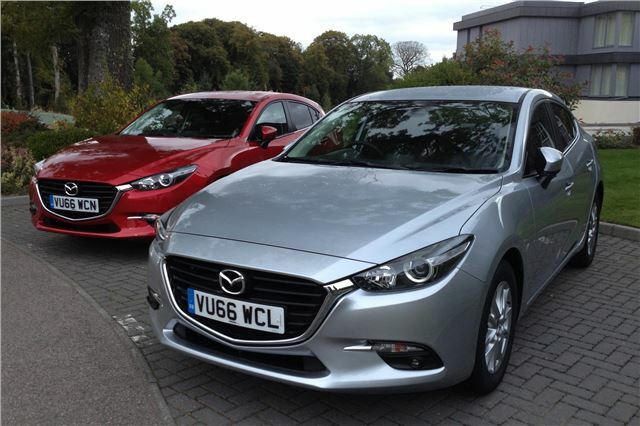 That aside I still rate the Mazda 3 as cream of the family car crop. 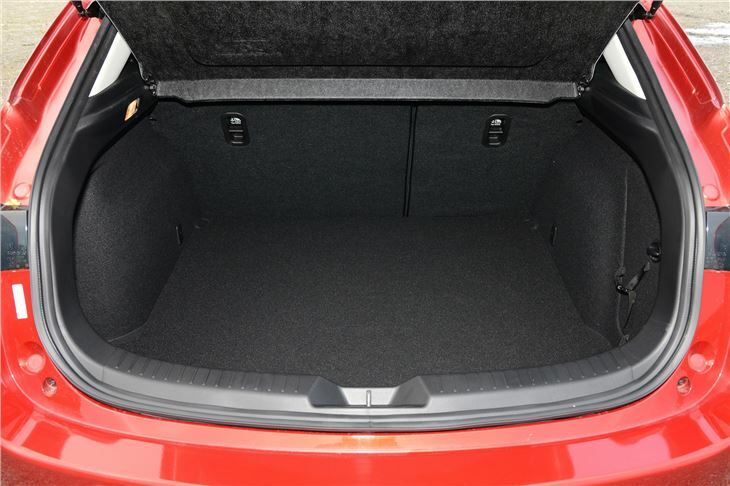 Audi A3s, Golfs, Leons and Octavias on the MQB platform are good, but some are still on twist-beam rear axles. 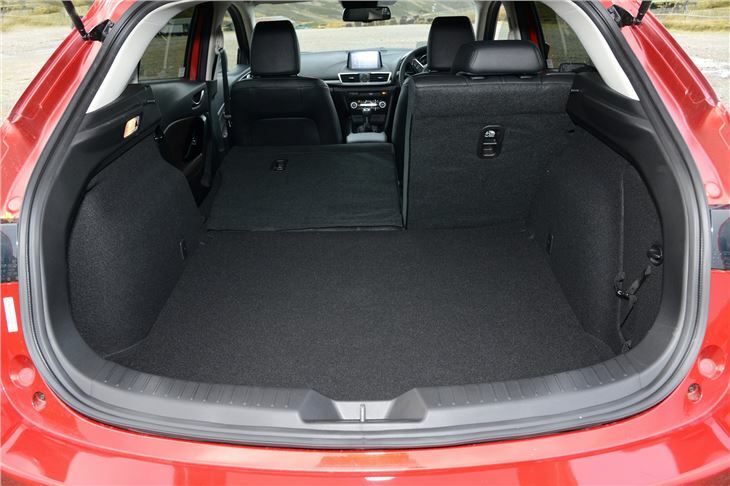 KIA cee’ds and Hyundai i30s are properly independent, like a Focus, but don’t have the sophistication of the Mazda’s steering and suspension. The new Megane with rear steer is good. But why the Mazda 3 wins is because it takes the stress out of driving quickly. It’s compliant, comfortable and rewarding to drive even at speeds far higher than most owners will ever push it to, and in my book that puts it up there above the rest.